Our Karl&apos;s Neuropathy Cream was created out of a desire to formulate a neuropathy cream to aid a friend of ours who was battling cancer. It is a beneficial cream to cancer patients as well as diabetics. We added a synergistic blend of essential oils to aid in pain relief as well as arnica. We packed in some of the best ingredients such as: jojoba oil, borage seed oil, organic sea buckthorn oil and arctic cloudberry seed oil. This product has proven to be very effective in the relief of the numbing tingling pain associated with neuropathy. This is our line of premium Scandinavian derived organic bath and body products. They were formulated using mostly sourced Scandinavian ingredients. They were all given product names of Nordic origins. They contain pure therapeutic grade essential oils (most are organic). Our Nørdik Karl&apos;s Neuropathy Cream is formulated using Jojoba Oil as our base oil. We have also sourced several “super fruits” from Scandinavia that result in a synergistic blend that creates a very premium cream. Arctic Cloudberry Seed Oil (Finland), a highly antioxidant ingredient that is excellent for skin cell regeneration and a reduction in wrinkles. 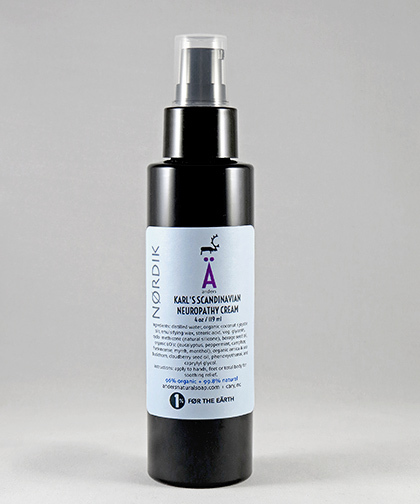 We use “sulfate/ paraben free preservatives” phenoxyethanol and caprylyl glycol in our Nørdik Karl&apos;s Neuropathy Cream. We are very proud of this line offering as Mike&apos;s grandparents emigrated from Scandinavia; his grandfather from Finland and his grandmother from Sweden. Our neuropathy cream is packaged in a black plastic bottle and a black pump with a rectangular label attached. Borage seed oil is derived from the extracted oil of the seeds. It is extremely high in gamma linoleic acid (GLA) that is extremely beneficial to skin. It exhibits a potent anti-inflammatory effect on the skin and also is very effective in regulating water loss and protecting the skin from injury and damage. Borage seed oil is especially beneficial to people with eczema and psoriasis. Simply put, Borage seed oil is just good for your skin. Arnica Montana flowers are great for the skin as they contain various ingredients for the skin like sesquiterpene lactones or helenalin, carbonic acid, flavonoids, coumarins and volatile oils. Helenalin along with flavonoid act on the skin that is exposed to stress and help in smoothening and renewing it. Arnica also has great antibacterial, anti-inflammatory and antiseptic properties and heals sunburns, wounds, minor burns and superficial phlebitis. It is also very effective as a pain reliever. Frankincense, also called olibanum, is an aromatic resin obtained from the Boswellia tree native to northeastern Africa. Obtained through steam distillation of the dried resin, this essential oil possesses anti-inflammatory properties. Frankincense has been highly regarded for thousands of years, believed to be an effective remedy for a number of ailments. Used today in perfumes and incense, this beautiful aromatic also doubles as a revitalizing skin care ingredient, especially in mature skin. Myrrh essential oil possesses many of the same properties as Frankincense essential oil. Used in a synergistic combination for thousands of years the antiseptic antioxidant properties are very healing to the skin. While most essential oils are derived from leaves and flowers, Myrrh is much more exotic. It is the resin, similar to a sap, of an African and Middle Eastern tree. We originally offered these oils in our products as a Christmas offering only, but soon found that they were so popular we now offer them year round. Derived from Peppermint, this waxy, crystalline substance is crisp and cooling. It has been shown to possess analgesic properties and is especially helpful with sore muscles and pain relief. Anti-inflammatory: Camphor essential oil is anti-inflammatory. It leaves a cooling effect that is very effective in relieving pain. It is also used to suppress the pain caused due to neuralgia by contracting the blood vessels and easing the pressure on the cranial nerve. Anesthetic: Camphor oil has the property to numb the sensory nerves in the skin and hence can be used as a temporary anesthetic. Using the oil can offer relief from pain caused due to insect bites, mild burns or skin irritation. We use a small amount of Camphor essential oil in our Medicated lip balm, but it does make for a great ingredient to add to this formulation to aid in the relief of painful dry lips in cold winter weather. Gently massage neuropathy cream into the affected area (usually the hands and feet). You should shortly feel a warming relief. Re-apply as necessary.